Logins this hour: 3830 ? Set up display preferences for your schedule at Amion.com. In OnCall, go to File / Preferences / Amion Display. Display schedule in calendar format only. This removes the option for viewing in table format at Amion. Dates down the left in table format. An alternate table view from the standard of listing service names down the left. Always display schedule by month. In OnCall you may prefer scheduling a week or two at a time and use the View / Span feature to keep the sections smaller. But online you may always want viewers to see the full month. Include tel # in pager directory. Displays both pager and telephone numbers in the call directory online at bottom of monthly schedule. Dark background and light text. Alternate display view at Amion from the standard white background and dark text. On login, go to. You have three options for the opening screen upon login. 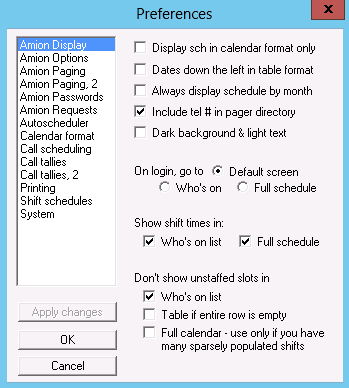 When "Default screen" option is selected, Amion chooses which screen is displayed upon login based on the size of the schedule. Normally, the default screen upon login is the "Who's on." However, if your schedule is small with only a few shifts, the default will be to view your schedule calendar first. Select "Who's on" or "Schedule calendar" options if you want to force Amion to always open to a specific page upon login no matter the size of the schedule. Only one can be selected. Show shift times in. Unselect either of the two provided options if you do not want shift times to appear next to your shift names at Amion. Don't show unstaffd slots in. Select either of the three provided options if you want Amion to condense the "Who's on" page and/or your schedule to not show unstaffed slots and only show staffed slots.